OSHA is still fulfilling its mission promoting worker and workplace safety. 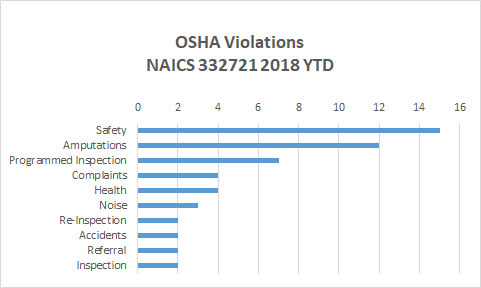 Safety, Amputations, and Planned Inspections led the OSHA inspection categories for NAICS 332721 so far this year. At PMPA we take a look twice a week at the OSHA inspections posted online for our industry. In the event that one of our members is on that list, we call immediately to offer our assistance. If it is a non-member, we look to learn what vulnerabilities are being encountered in the industry shops not belonging to PMPA. So far this year, OSHA has posted notices of 53 inspections for our NAICS code- 332721 online. 53! The single largest category were for “Safety” – 15 of 53, 28% of all inspections posted. The second most frequent category was “Amputations“-12 of 53, 23%. This really is aggravating. There is no excuse for anyone to be losing body parts. We need to contact our people immediately to review the basics about pinchpoints, rotating equipment, and the pointlessness of trying to stop a lathe with our fingers or thumb. Programmed (planned ) Inspections were third with 7 of 53 or 13%. Routine enforcement is still a “real thing” at OSHA. 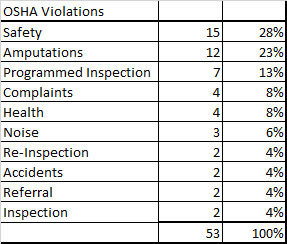 Complaints came in at fourth with 4 out of 53 inspections being initiated as a result of a complaint- 8% of inspections due to complaints..
Rounding out the ten causes were Noise, Reinspections, Accidents, Referrals, and Inspections. OSHA is still fulfilling its mission promoting worker and workplace safety. The above reasons show how your peers are being examined. Are you ready for an OSHA inspection? Original Data sourced from USDOL OSHA. Summary: A change in the interpretation of the word ‘FEASIBLE’ by OSHA could cause all shop owners whose shops noise level exceeds 85 dB to be REQUIRED by OSHA under this new definition to install expensive engineering or administrative controls to abate the noise to levels below the action level. 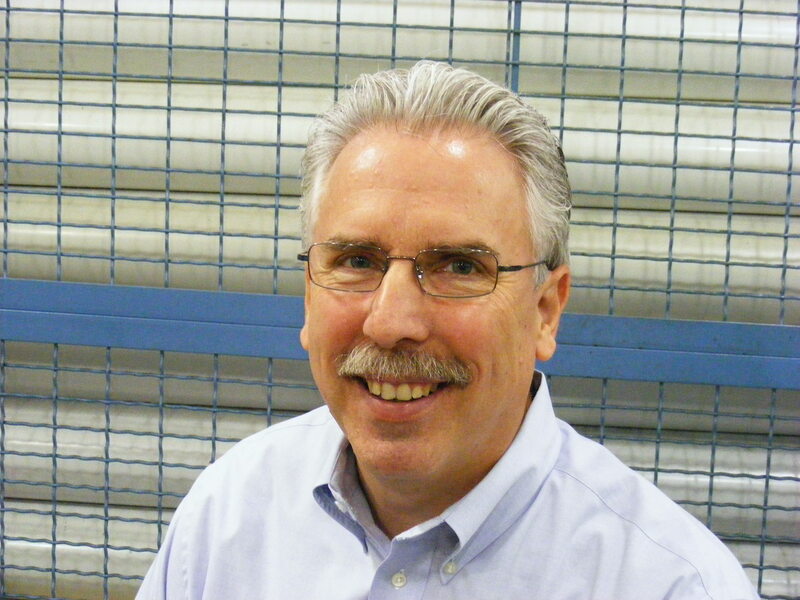 PPE could no longer be acceptable as the sole means of addressing noise exposure in our shops. 1) Determine the noise level in your shop to see if it exceeds 85dB TWA. 4) Perform a business case analysis to see if your company can remain in business if this change to the definition becomes law, requiring you to purchase sound dampening or reduce production. 5) Document the cost to comply, loss of jobs, and any reduction in competitiveness, capacity or other issue that is a result. 6) Send to Miles Free mfree@pmpa.org so that I can include in PMPA’s formal comments. 7) Send a letter to the Docket for comments on this proposed change in interpretation as well as one to your congressman and please copy PMPA. PMPA and other metalworking associations requested, and received an extension on the Comments deadline so that we could obtain facts needed to properly assess the consequences of this new interpretation. Comments are now due by March 21, 2011. We need your facts to make our case! We need your data now to effectively represent you on this potentially shop closing issue. All data that we have seen from Member shops so far has shown that these shops will need to add sound dampening equipment. The shop (and machininst jobs) you save may be your own.